Also serving communities of Silverdale. There are 228 Assisted Living Facilities in the Bremerton area, with 5 in Bremerton and 223 nearby. The average cost of assisted living in Bremerton is $2,999 per month. This is lower than the national median of $3,346. Cheaper nearby regions include Burien with an average starting cost of $1,995. To help you with your search, browse the 987 reviews below for assisted living facilities in Bremerton. On average, consumers rate assisted living in Bremerton 4.1 out of 5 stars. Better rated regions include Bainbridge Island with an average rating of 4.6 out of 5 stars. Caring.com has helped thousands of families find high-quality senior care. To speak with one of our Family Advisors about assisted living options and costs in Bremerton, call (855) 863-8283. Bremerton, Washington is located on the Kitsap Peninsula across Puget Sound from Seattle and just north of Tacoma. It is best known for its locally grown blackberries and has an annual Blackberry Festival in September to celebrate the tasty berry. This, among other community events and activities, makes Bremerton a good option for seniors, which may be why there are a whopping 59 assisted living facilities in the area. Five are located in the city proper, and another 54 are nestled in nearby communities. All of these ALFs are licensed and regulated by the Washington State Department of Social and Health Services. Weather in Bremerton is rainy but temperate like it is in the other communities in the northwestern part of Washington state. It receives over 56 inches of rain per year, which is 17 inches over the national average. Winter lows fall to about 35 degrees Fahrenheit in January, while summer highs only hit 77 degrees Fahrenheit in August. With good air quality throughout the year, senior residents won’t have to worry about difficulty breathing outside, even if they have minor respiratory issues. Despite its beautiful environs, Bremerton is surprisingly close to the national average when it comes to cost of living. It is actually below the state average, especially when it comes to things like housing. Other necessities like groceries, health care services and utilities are in line with both state and national averages. The major issue with Bremerton may be its crime rate. It has an overall violent crime average that is higher than both the state and national medians, making it only safer than only 8 percent of U.S. cities. Kitsap ACCESS Transit provides buses that are meant for seniors to get around the Bremerton area and the Kitsap Peninsula on plotted routes. However, riders must first be deemed eligible after filling out an application form. The Bremerton area is home to world-class medical facilities, including Harrison Medical Center, in the event of medical emergencies or illness. Assisted Living costs in Bremerton start around $2,999 per month on average, while the nationwide average cost of assisted living is $4,000 per month, according to the latest figures from Genworth’s Cost of Care Survey. It’s important to note that assisted living rates in Bremerton and the surrounding suburbs can vary widely based on factors such as location, the level of care needed, apartment size and the types of amenities offered at each community. Non-entitlement programs to help seniors to pay for assisted living facilities are offered by Washington state through their Home and Community Based Services (HCBS). 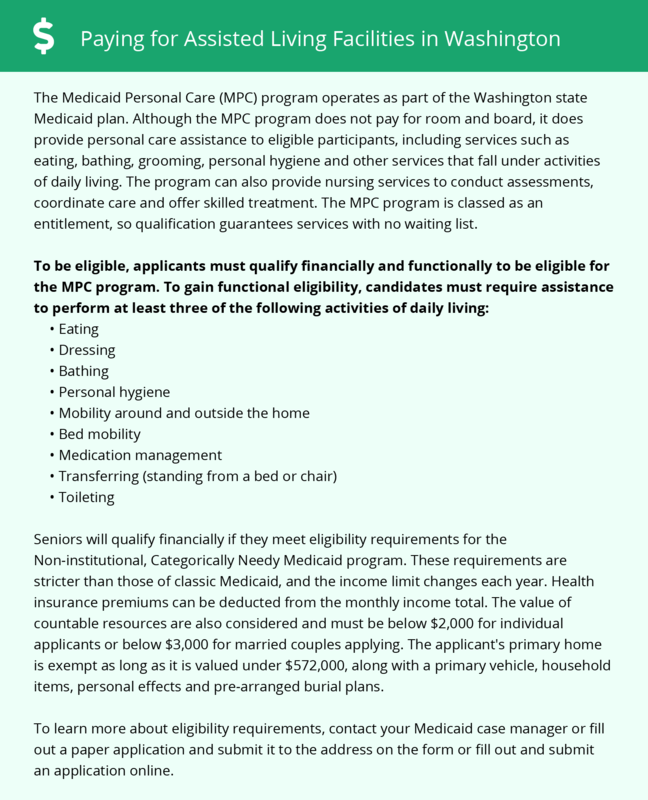 However, since this is a non-entitlement program, applicants must qualify to receive this financial aid through the Washington Medicaid COPES (Community Options Program Entry System). Once qualified, eligible applicants will have an assisted living facility of their choice at least partially paid for. Bremerton and the surrounding area are home to numerous government agencies and non-profit organizations offering help for seniors searching for or currently residing in an assisted living community. These organizations can also provide assistance in a number of other eldercare services such as geriatric care management, elder law advice, estate planning, finding home care and health and wellness programs. To see a list of free assisted living resources in Bremerton, please visit our Assisted Living in Washington page. Bremerton-area assisted living communities must adhere to the comprehensive set of state laws and regulations that all assisted living communities in Washington are required to follow. Visit our Assisted Living in Washington page for more information about these laws.